The Intellectual Property Department is committed to enhancing public awareness of intellectual property protection and promoting respect for the rights of others. Intellectual property seems an abstract concept that is difficult to understand to many. 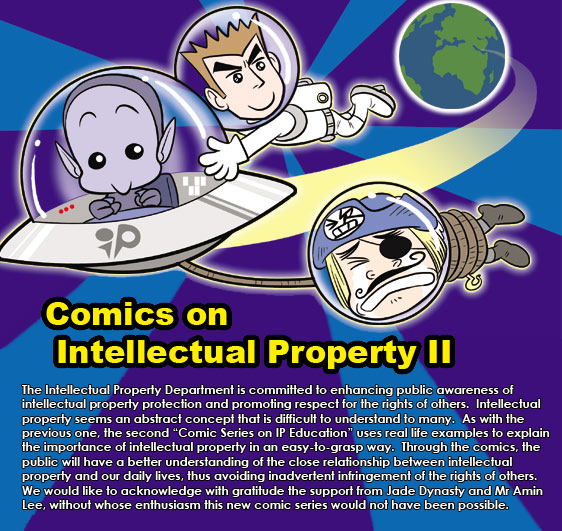 As with the previous one, the second “Comic Series on IP Education” uses real life examples to explain the importance of intellectual property in an easy-to-grasp way. Through the comics, the public will have a better understanding of the close relationship between intellectual property and our daily lives, thus avoiding inadvertent infringement of the rights of others. We would like to acknowledge with gratitude the support from Jade Dynasty and Mr Amin Lee, without whose enthusiasm this new comic series would not have been possible.